A guide to developing the perfect sales process to help your team achieve optimal, predictable results. When all your time is focused on selling, it’s hard to commit to reading every book or internet article on the most effective sales process. To help you prioritize, we decided to sit down and create this guide for you. Whether you’re a pro salesperson or simply considering sales as a profession, we hope this post is helpful in understanding what elements are needed to create a highly effective sales process. A sales process is a series of stages an opportunity goes through on its way to becoming a customer or client. If you’re selling, but haven’t mapped out a sales process, you still have a sales process. What you don’t have is visibility into that process. A documented sales process establishes a common framework and language for your team, so that everyone understands the progress and status of each opportunity in the pipeline. So, if your team understands the overall progress of an opportunity and has visibility into each stage of the process, suddenly you’re empowered. You might begin to see consistent problems between one stage and the next, and now you can fix it. You notice one of your reps is significantly more efficient in a given stage of the process than the rest of your team, so you replicate her winning strategies as a new standard. Know your process. Understand it. Measure it. Optimize it. 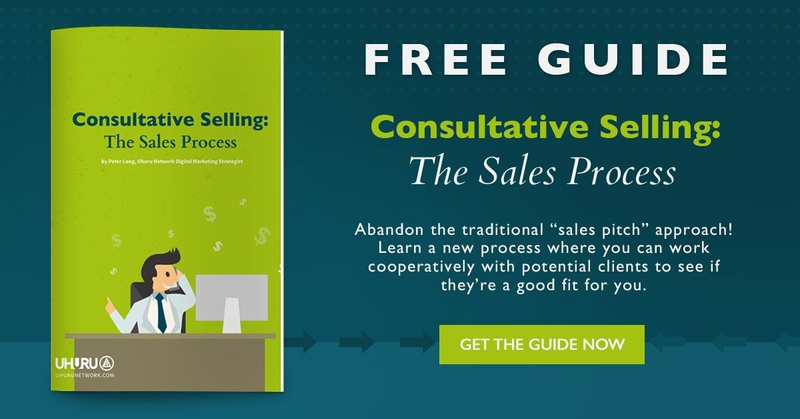 While the sales process is comprised of the stages a prospect goes through on their journey to clienthood, a sales methodology is your approach to the sales process. It’s how you go about selling. We list a number of sales methodologies below, but you don’t have to stick to just one. Use what elements complement your company’s mission, culture, industry, product or service, as well as your buyer personas, in order to create an individualized process that provides the most value to your buyer. In Solution Selling, your responsibility is to provide a solution to your buyer’s specific problem that results in measurable improvement. It’s not to push a particular product. Solution Selling is usually applied as a consultative selling approach. Here at Uhuru, our consultative sales approach has helped shape our sales process—Connect, Explore, and Diagnose. Consultative selling is buyer-centric, so don’t be too rigid in your sales process. Ask good questions, listen well, and proceed according to the best, most thorough and impactful solution to your buyer’s problem. PRO TIP: You can be too consultive too soon. As Jill Konrath warns in SNAP Selling, buyer’s don’t want to sit and answer all your consultative questions—they want to hear why you’re worth their time. Like Solution Selling, the Inbound Sales Methodology is buyer-centric in that it seeks to prioritize the buyer’s journey and needs over that of the seller. But inbound selling is unique in its approach to prospecting. Because consumers have greater access than ever before to product and solution information, a follower of the Inbound Sales Methodology attempts to have buyers come to them. They’ll do this by providing personalized content that is designed to meet buyers’ objectives and help them solve challenges. This way, they become part of their buyers’ sales process. In “What Is Outbound Sales?,” we describe how to know if you’re ready to invest in outbound sales and scale your lead generation efforts. It is possible, after all, to do outbound sales in an inbound way by leveraging your inbound marketing efforts to map a thorough buyer persona. From there, personalize your messaging and communicate based on what is important to your buyer. Here at Uhuru, we believe it’s our responsibility to provide value upfront at no obligation in all our outbound sales efforts. In the book The Challenger Sale, Matthew Dixon and Brent Adamson argue that solution selling is no longer effective, and that buyers are fed up with answering probing questions from sales reps who offer no value. So, they say, the highest performing sales people are really the ones who have a strong understanding of their clients’ business and will challenge their clients when necessary in order to provide the best solution possible. In response to today’s educated buyer, Challengers aren’t afraid of a little debate and will push back when it is in their clients’ best interest. Pro tip: It’s very possible to have reps who fit better to other sales methodologies and are still high performers. How you sell has become more important than what you sell. While the stages and their names vary depending on your approach, these are the basic elements of the sales process. Also known as prospecting, targeting, or lead generation, the first stage of the sales process involves identifying new leads for your funnel. While we list attack as the first stage in the sales process, that doesn’t that mean there’s no preparation to be done—we don’t just attack willy-nilly. In “12 Reasons Uhuru Is Able to Repeatedly Deliver Marketing Success,” we describe the importance of listing your ideal buyers and documenting their buyer’s journey before attacking the market. Do your homework, then attack the market to find more customers that look like your best customers. The second stage often referred to as “qualifying,” is about making that first contact and initiating a conversation so that both the seller and the potential buyer can determine whether continuing a conversation makes sense. We recently initiated a Connect Call with a prospect who suggested that we “think of this as coffee”—an apt analogy from the world of dating. Here at Uhuru, we know that we’re not going to be a good fit to help every person we speak with. But by adding value before we’ve been able to qualify fit, we establish the trust needed to have an honest dialogue. As we share in our post on consultative selling, we find that adding value early is more productive than just checking off the boxes of budget, authority, need, and timeline. Sure, we eventually learn those things, but what’s your hurry? It’s just coffee. Besides, if you’ve done a good job with step one of the sales process—i.e., with your ideal buyer personas, their buying journey, and attacking the market—you should have a pretty good idea already that you’re not barking up the wrong tree. Now is your chance to learn the information you need to learn in order to determine if you’re a good fit to help the prospect solve their problem. And, thanks to your restraint in not beating your prospect over the head with a B.A.N.T., they are eager to share this information. While some refer to this stage in the sales process as “research,” perhaps the metaphor offered by Jack Quarles and Ian Altman in their book Same Side Selling is more appropriate—solving a puzzle. Research is something you ought to have done before your first conversation with the prospect. And, as Quarles and Altman argue, getting the information you need to qualify a prospect shouldn’t be an adversarial encounter. After all, this isn’t a game with a winner and a loser. It’s a puzzle, and it’s best solved by addressing its little enigmas from the same side of the table. By the end of this stage, you ought to be able to state with a great deal of confidence whether or not you can solve your prospect’s problem. If you can, you ought to be able to prescribe a solution. Often called “present,” referring to a formal presentation or demonstration, the fourth stage of our sales process is where you prescribe the solution in light of your diagnoses. If you’ve taken a consultative sales approach, your prospect should see you as a trusted advisor. And as a trusted advisor, it is not only in your prospect’s best interest, but also in yours, to diagnose honestly and to the best of your ability. Have you ever been to a doctor who referred you to a specialist? This is the level of trust you need to cultivate with your prospects and customers. If you’re not the best fit to help them, refer them. Nothing builds trust like showing this level of restraint. Pro Tip: It’s more important that your prospects trust you than like you. If you’re a good fit (and your prospect believes so too), they’ll receive your diagnoses, likewise, in good faith. Keep in mind, however, that, depending on your prospect’s level of expertise in your area, it may be easier or more difficult to prescribe effectively. For example, if your prospect’s level of expertise is very low, it may take more effort and time on your part to help them understand it might be a good idea. The writer Anton Chekhov said that if a playwright includes a gun anywhere onstage in Act 1, it must go off by the end of Act 3. The “Closing” stage is Act 3. Everything you did in the beginning of the sales process should have supported and served this stage and the following stage. If you skipped any critical components of your sales methodology—e.g., getting buy-in from all decision makers—you’ll know soon enough. If your deal does not close despite your honest efforts and sincere diagnosis, take note of how you intend to improve your process for your next prospect. Many examples of the sales process exclude this stage. But if you’re truly interested in helping your prospect succeed in achieving their goals, you’ll want to think of the process as continuing on, even after the prospect’s initial problem has been solved. Be involved in the next stage of implementation for the prospect. If that’s a kick-off call with your services team, then be on that call. Once you’ve established that the expectations you’ve set for the prospect are successfully being met and you’re no longer involved on a regular basis, make it a habit to check in with your clients about twice each year regarding the results of your solution and any problems or challenges they may be experiencing now. Creating a sales process is a process in itself. It’s one that never really ends. So, how do you get started? Here are a few things to keep in mind as you begin. As we mentioned earlier, if you’re actively selling, you have a sales process. What you may not have is visibility into that process. It is imperative that you know what you’re doing now in order to establish some baseline by which you can begin to make incremental improvements. You’ve heard of a minimum viable product? Well, this will be your minimum viable map. It doesn’t have to be perfect (and I promise you, it won’t be). Again, this is for the purpose of establishing a baseline by which to iterate. Begin by looking at a manageable number of deals; e.g., 10-20. Can you distinguish discernable steps or stages in the process already? How long did each stage take? How many touches were made during the sales process and/or during each stage? If you’re keeping good data, this will be easier for you. Ensure reps are entering all the relevant information into the CRM, and, where possible, use pick lists to keep data clean. Having a generic sales process map is better than having no map at all. So, document what you can and understand that it’s just a starting point. Each stage in the process must be unique and serve a purpose. And everyone on your team must understand what moves a prospect from one stage to the next. The criteria shouldn’t be subjective or you’ll never really be able to trust that your process is accurately reflecting progress. When does a lead become an opportunity, for example? It mustn’t be when a Rep has a good feeling about the prospect because, as it happens, they’re both from Michigan and just had a sell conversation about vacation homes in Grand Haven! It can, however, be that the Rep uncovered real need within an established timeline and the prospect showed up for the conference call with the Account Executive. Keep your criteria objective and your team on the same page. Your sales process is an ever-evolving map. It will be informed by your market and your company’s internal characteristics, but should always keep in step with your buyer’s journey. Plan to continue to optimize your sales process over time by implementing incremental changes based on measured results. In order to know what changes ought to be made to your sales process map, you’ll want to monitor the most relevant metrics at each stage. You may want to build reports in your CRM showing the following data, at least, during a given period of time: number of deals in each stage, deal conversion rate from each stage to the next, average number of days deals spend in each stage. You can even look at the above data by Rep and standardize what’s working across the team. This alone will give you a good idea of where to prioritize your time and energy. Give thoughtful consideration to what metrics will be most impactful for your business. Novice chefs think about what they can add to a dish; great chefs think about what they can take away. Don’t complicate your sales stages. Make sure everyone on the team understands the difference between one stage and the next, as well as what criteria is necessary for advancing a prospect to the next stage. If one person on your team doesn’t understand the difference between stages, go back to the drawing board. Establish objective criteria that must be met before a prospect leaves one stage and advances to the next. If any of the criteria is subjective, you’re leaving things up to the salesperson’s interpretation. And if your sales team is advancing prospects based on their gut, it will be difficult to tell with any confidence what is and is not working in your sales process. For the same reason, it’s best if the criteria you use is based on the actions of your buyer—e.g., sharing their budget or introducing you to the decision maker. There’s no need to limit yourself to the sales methodology that’s on your plate. Because, let’s face it, sometimes you need a little variety to stay successful. No single methodology is a panacea. You’ll always need to keep your market and your organization’s internal dynamics in mind—as well as your buyer’s journey—and adjust accordingly. In the end, it’s not about your process, which is imperfect anyway. It’s all about helping your buyer. So, don’t be afraid to skip or rearrange a couple steps here and there if that’s how your buyer buys. A successful sales process will allow high-performing reps to color outside the lines when needed, while giving low-performing reps enough structure to be successful. Whenever a prospect advances from one stage to the next, this should reflect meaningful progress toward a purchase decision. If you find that prospects advance in your current process without meaningful progress, you know it’s time to optimize your steps. Once your sales process is outlined and followed in such a way that the above tips for success are reasonably adhered to, create a playbook for each stage. In each playbook, include an overview of the stage, its purpose, your strategy, main objectives, and a step-by-step outline that illustrates how to successfully navigate the stage. Leverage best practices and train your reps with these playbooks. As with your sales process map, your playbooks are living documents. Optimize as needed. Once you’re living every day in your sales process, you’ll begin to learn what you need to be successful in serving your prospects in each stage. You might find that in a given stage you need particular content to advance your prospect; e.g., a blog post to overcome an objection, a questionnaire to gain a better understanding of need, or a case study to leverage social proof. Certain technology, also, may serve your needs best in certain stages. You might find that a particular email outreach tool drives significant success in your prospecting stage, while others make conference calls seamless or make it easier for the buyer to sign on the dotted line. It will also become clear where collateral and technology can’t fix the issue, and training is your key to greater success. In sum, once your sales process is sufficiently optimized, keep an eye out for where your team can benefit from the content, technology, and training. Today, we shed some light on sales process—what it is, the common stages involved, and how to build and optimize your own. A sales process is a work in progress, so don’t worry about it being perfect before building your map. Know your market and your organization, and build your sales process accordingly. In the end, your sales process is about serving your buyer. So, it ought to be designed with their buying journey in mind.